Posted on Tuesday, April 19th, 2011 at 12:15 pm by Pieter van der Westhuizen. Microsoft Business Contact Manager or BCM is a great way for mostly small businesses to manage their business contacts, sales leads and projects. The beauty of BCM for MS Office developers is the fact that it is entirely contained within MS Outlook; giving the user a seamlessly integrated experience with Outlook. Of course this fact provides you as Office developer an opportunity to add even more functionality to BCM by using Add-in Express. First, you need to make sure that BCM is installed; if you’re using Outlook 2007 you’ll see an additional store in MS Outlook entitled Business Contact Manager. However, if like me, you’re using Outlook and BCM 2010, you’ll see an additional Business Contact Manager store as well as an Outlook solution module / pane. 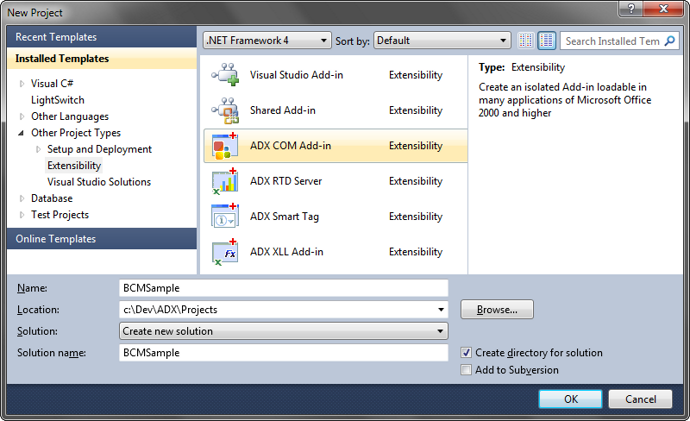 Next, start a new ADX COM Add-in using Visual Studio. Complete the New Microsoft Office COM Add-in Wizard by selecting your programming language, minimum supported Office version and Microsoft Outlook as the supported application. 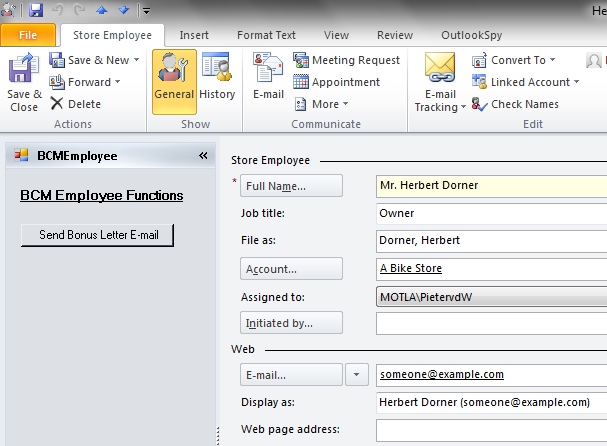 We’ll add an advanced Outlook region and set it to only display on BCM Employees inspector windows. In order to accomplish this add a new ADXOutlookFormsManager to the AddinModule designer surface. Next, add a new Outlook Form item to your project. 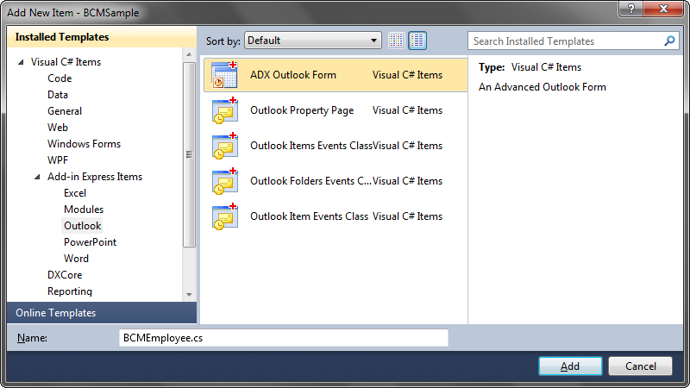 Switch back to the Addin Module designer surface and add a new item to the ADXOutlookFormsManager you’ve added earlier. Set its properties as specified below. By setting the InspectorMessageClass we ensure that our advanced region will only be shown on the BCM employees form. If you’re wondering how to get BCM InspectorMessageClasses, I recommend you use a utility called OutlookSpy. When you install OutlookSpy it adds a ribbon tab with a host of useful tools. To see the BCM employees form’s MessageClass, open an instance of it and click on the CurrentItem button on the OutlookSpy ribbon tab. This will display a window with all the information you need about the current Inspector object. Build, register and run the add-in and you’ll notice the advanced Outlook region only displays on the BCM employee form. 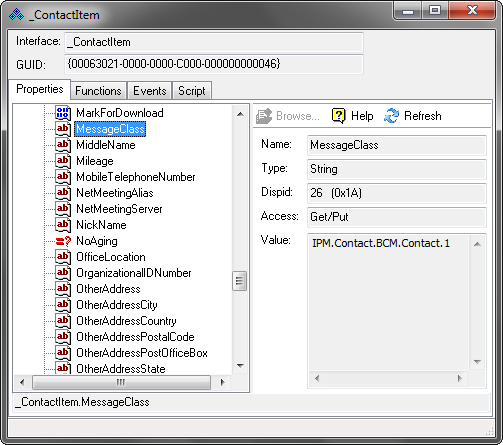 This code will check if the current inspector object is a Contact and whether the current object’s MessageClass property is IPM.Contact.BCM.Contact.1. If it is, the ribbon tab will be visible, if not it will be hidden. Thank you for reading. Until next time, keep coding. This looks interesting but I’m not quite sure what is all provided once purchased. Is there something else you can share? I’m using BCM 2010 and Outlook 2010 and am looking for additional assistance with BCM; user friendly, project management, etc. Do you require more information on using BCM for Outlook or on customizing it using Add-in Express? Is it possible to create new reports (more detailed) using these Add-in? I need to create a report that cross Contacts x Oportunitys (like a table with all contacts in lines, and oportunitys in collumns)? I doubt you would be able to create a new report since we do not really have access to the BCM object model. You can however access the BCM database directly and create reports that way using either Excel or a reporting tool like Crystal Reports.